Looks sweaty and uncomfortable, but gets great reviews. Heat added. Thanks just ordered, 5% quidco too, so hopefully a few quid back there. I saw these in the asda home store yesterday, boxes are fairly big so would have been difficult to trasport in my small car, but a decent size hatchback should cope. Just got a text from Asda Direct to say black one back in stock. It comes folded and is preety straight forward to unfold and just attach legs.. 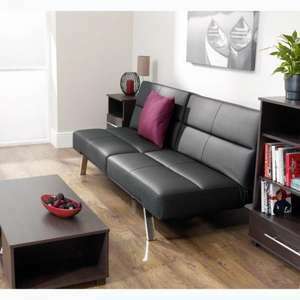 I just returned mine after a few months as it was very uncomfortable to sleep on (pretty much impossible as has the wood seam in the middle) and the sponge seating gave way after quite some use..
however as a sofa for a spare room just for show rare use etc its pretty good..looks good and good seating ..
hope this helps someone out..